Saving more. Consuming less. Paying down debts. Making sacrifices. Most Americans have not experienced austerity in a long time, so the decade ahead may come as a shock. Expect continued high unemployment, slow wage growth, the possibility of social and political unrest, higher taxes, cuts in government services. Hope for moderate inflation to help reduce public and private debt loads. And be happy if all that is the only price this country must pay as part of the financial hangover from the party that began in 2001. As the United States recovers from the “Great Recession,” economic stimulus has so far masked the austerity ahead. The U.S. government, like others around the world, has solved the post-housing-bubble banking crisis by issuing debt--in effect trading one set of problems for another to create what Cabot professor of public policy Kenneth Rogoff calls “an illusion of normalcy.” But, says Rogoff (coauthor of This Time Is Different, a study of eight centuries of financial crises; see “What This Country Needs,” January-February, page 18, for a review), history shows that waves of banking crises are typically followed by waves of debt crises two or three years later. How has the United States fared compared to these averages? “It has been driving right down the tracks of a typical postwar deep financial crisis--it’s incredible,” Rogoff reports. Unemployment typically rises 7 percent; “We went up 6.” The average fall in housing prices is 36 percent. “The U.S. went down 33 percent and clearly has more to go.” In equities, the average fall was 56 percent, which is “exactly what the S&P [500 index] did. “The only dimension in which the U.S. did better,” Rogoff says, “is in the depth of the recession, which appears to have been less” [deep than usual. ]” GDP typically drops 9 percent from peak to trough. “We were about minus 4 percent” (based on preliminary numbers). But there is one dimension on which the United States was worse than average: the rise in government debt. In a typical crisis, that goes up 85 percent in three years, Rogoff reports. “We are going to blow through that,” he says. But that tradeoff--rescuing the economy by assuming lots of debt--is not without risks, especially for a debtor nation. This country’s debts include the international debt (determined by what is known as the current account deficit (an annual measure of the amount by which consumption exceeds production); see “Debtor Nation,” July-August 2007, page 40) and the national debt (determined by the federal deficit). “Both were on unsustainable pathways before the recession, says Harpel professor of capital formation and growth Jeffrey A. Frankel, of Harvard Kennedy School. President Obama’s economic stimulus package represents even more debt, “but is a relatively small part of the total picture” that doesn’t even make Frankel’s list of the top three contributors to the total debt path: the rise in the cost of Medicare and Medicaid; Social Security (which he says is solvable with “minor” but politically difficult adjustments); and the fiscal path that President George W. Bush put the country on in 2001 (“which was not only tax cuts, but also a sharp acceleration in the rate of spending, both military and domestic,” says Frankel, who served on the Council of Economic Advisers in the Clinton administration, and on its staff during the Reagan administration, under Martin Feldstein, now Baker professor of economics). As early as March 2007, discussing the nation’s escalating debt, Frankel told this magazine, “I don’t blame Bush for the 2001 recession, but I blame him for the severity of the next recession,” explaining that the president had been right to cut taxes as a stimulus after the 2001 recession, but shouldn’t have allowed the tax cuts and spending increases to continue once the economy recovered--because then there would be inadequate room for fiscal expansion when the next recession hit. Without the option of cutting taxes, future policymakers would be forced to increase spending as the only option for economic stimulus. But when a debtor nation keeps borrowing, the question arises: How long can that continue? Frankel says, “Many people assert that the world’s investors had a limitless willingness to buy U.S. assets,” for a variety of reasons. “One version of this view is that we earned the privilege because we have such a good financial system. That one is looking a little tarnished.” Another version hinges on the role of the dollar as the international currency. “I think there could be a limit to foreigners’ willingness to absorb dollars,” he says, alluding to the long-term possibility of a currency crisis: a run on the dollar that would lower its value suddenly. “People talk about the declining role of the U.S. in the world economy,” says Boas professor of international economics Richard Cooper, but at the moment, “It is hard to find a big economy that is not in the same boat.” Some differences in the details are significant, he notes, but “the fact is that Germany, Britain, Italy, France, even China are running budget deficits now that are way above what they would like them to be--and that’s certainly also true of Japan” (which was affected even more than the United States by the current recession: its GDP dropped 6 percent). To err on the conservative side in papers he has written about global financial imbalances (in which foreigners’ “excess savings” end up being loaned to American consumers at low interest rates), Cooper uses the U.S. share of gross world product (GWP), which stood at about 27 percent in 2006-2007. “But a metric which, in a sense, would be even more appropriate,” he says, “is share of marketable securities in the world” (about half of which are in the United States). That’s because, internationally, as much as 70 percent of the publicly traded stock in many corporations is in fact owned by national governments. “For example, in China,” he explains, “there are now about 1,000 listed companies, mostly state enterprises, and the government owns 70 percent of the shares.” National governments aren’t sellers, so that means “a maximum of 30 percent are available for trading.” In other words, for a hypothetical investor operating without home bias (the tendency of investors to keep more of their money in their own national economies), the United States should be the recipient of far more inflows of foreign capital than it is already. Foreign investment in the United States now stands at just 12 percent, not 27 percent (which would reflect the U.S. share of GWP) or 50 percent (the U.S. portion of marketable securities worldwide), so if Cooper is right, the global imbalances could last for a very long time, or even grow. Indeed, he has written a paper projecting, in a ballpark way, which countries will contribute most to GWP through 2030. “The U.S. share declines a little, but not a lot. The big gainer, not surprisingly, is China. India doubles its share, but from 2 percent to 4 percent, so it still remains a small economy in the world. 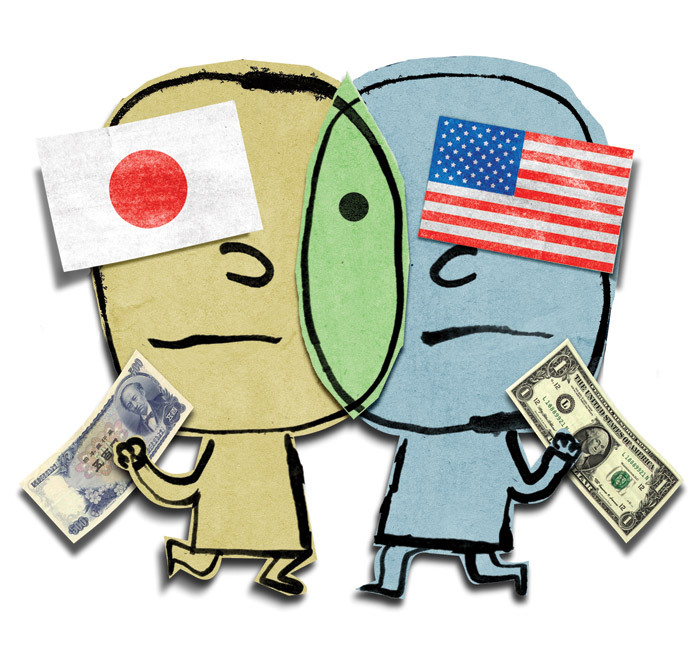 The big losers are Japan and Europe, largely for demographic reasons.” The U.S. role as net consumer in global imbalances could therefore persist for a long time, he believes. Another gauge of the U.S. imbalance in trade and capital flows with the rest of the world is the current account deficit, an annual measure of the amount by which consumption exceeds production. In 2006, the U.S. current account deficit (CAD) reached 6 percent of GDP, a level most economists felt was unsustainable. Cooper disagreed then and still does. In general, he doesn’t see a strong link between such global imbalances and the financial crisis. Even though the willingness of foreigners to lend Americans the money that funded U.S. consumption habits clearly played a part in keeping this country’s interest rates low and, by extension, in fueling the housing bubble, Cooper thinks that mass euphoria--psychological factors--combined with a “lax or totally absent regulatory framework,” played a more important role. Now, with the recession dampening American demand for foreign imports, and with exports gradually rising with help from a slowly declining dollar, the CAD has fallen to about 3 percent of GDP. But whether this measure of capital flow with the rest of the world goes up or down from here is a big question mark. Cooper thinks it will rise back to the 4 or 5 percent range--and that eventually, barring a dollar crisis (which he cannot rule out), it will decline slowly over decades. “We know what the aftermath of a debt crisis looks like,” he continues. The United States is now through the immediate aftermath, a period called the stabilization phase, in which countries are just trying to stabilize their economies. Recalling the 1970s, Frieden notes, “If you are a Latin American country, you are trying to get inflation down from 5,000 percent and deal with huge budget deficits that are the result of trying to ameliorate the effect of the crisis,” Frieden notes. The United States is lucky enough to be able to issue debt in its own currency, so its citizens don’t have to deal with hyperinflation. But all countries emerging from a foreign debt crisis, Frieden says, must adjust to a new reality: they can’t continue running their economies on funds borrowed from the rest of the world. Furthermore, unemployment is not likely to improve soon, Frieden says. Roughly 44 percent of those currently unemployed have been unemployed for more than six months, and 25 percent have been unemployed for more a year. “That is way out of line with prior experience,” in which “people usually get jobs after six weeks,” he notes. There are other bright spots--if the prospect of inflation can be called that. American exports have been up thanks to demand from Asia--particularly China and its neighborhood, an area that continues to grow. American companies export software and energy-related technologies, as well as complicated machinery like aircraft. Educational, medical, and legal services are also big exports, but Frieden believes that the real unexploited opportunities lie on the manufacturing side, in the underutilized industrial belt of the Midwest. He hopes for a resurgence in the export of complex goods such as heavy machinery, building equipment, agricultural implements, controlled machine tools that automate component production from start to finish, and so on. But such transitions are never easy, and Americans have not experienced a period of true economic malaise since the late 1970s and early ’80s. Jonathan Shaw ’89 is managing editor of this magazine. A key to the markets?